This week, almost 100 P7 pupils from targeted schools in the North West headed to the University of Ulster’s Coleraine campus to take on the role of Crime Scene Investigators (CSIs). The budding supersleuths were given the opportunity to use forensic chemistry techniques to help identify the perpetrator of a crime. The CSI day was part of the Step-Up programme’s ‘Engaging Young Minds’ initiative which is an innovative programme for primary school pupils launched by Step-Up at the University of Ulster. Primary school pupils are given the opportunity to engage in a wide variety of activities including interactive lectures, poster competitions, quizzes and science fairs. 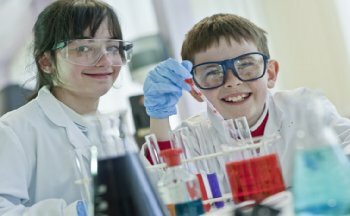 These activities aim to raise pupil’s educational aspirations and to help encourage participation in science subjects. The first place winners from Hollybush Primary School were awarded a digital camera with teams from Lisnagelvin Primary School winning second and third places.